Most fitness fanatics are rarely on the fence when it comes to spin bikes. Some people hate them because of the intensity of the workout and the motion involved. Those that like a gentle session pedalling on a recumbent exercise bike will struggle with the contrast. Then there are those that love the method. This is a tough session with the potential for great rewards. But, this can only happen with a well-made, top rated spin bike. The best bikes offer a great blend of features and settings for a comfortable, productive session. 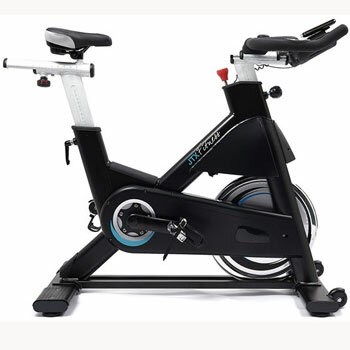 Important features to look out for when choosing between the best spin bikes on the market. The first thing that consumes need to do here is decide on the style of spin bike that they want. Is this meant to be a tough model that replicates the machines used in the gym. Or, is this a more accessible option for newcomers looking to try spinning at home? Those that want the former need to consider the weight of the flywheel, the programming options and the ability to adapt the frame. 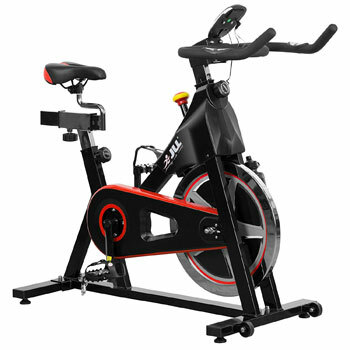 The best spin bikes will have a heavy flywheel for a tough, smooth action with room to develop. They will also be adjustable for optimal riding positions. This can help with posture and gives users and edge while toning up. It also helps to replicate the feel of road cycling, for those keen on some serious training. Then there are the machines for those that are just starting out. A smooth motion and adjustable frame are still important here. However, the bike shouldn’t be too high-tech and intimidating for first-timers. This means that comfort and user-friendly elements are just as crucial. A comfortable seat, understandable console and a series of fun programmes can all go a long way. 10 top rated spin bikes from leading brands. Let start this guide to the best top rated spin bikes with a “pro” model. 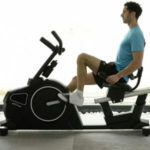 These machines always stand out to keen gym users because of the expectations of high performance and great features. This definitely seem to be the case with this JLL model. The stand out features here are the 20kg belt driven flywheel, 7 function monitor and 3 piece crank. This means that this model is built for tough treatment and fitness progression. It is easy for users to monitor progress with the console and to work on fitness and stamina with the different settings. The heart rate sensors also help here. In addition to this, users appreciate how quiet, comfortable and reliable the product is. There are great ergonomics to the adjustable seat and handlebar, as well as great safety features. It is a well-built, gym-ready machine, but still has the benefits of the emergency stop system and transport wheels. 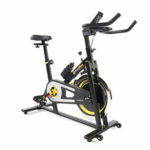 This XS Sports spin bike is another model where the designers seem to have considered the user experience on a wider level. The workout is great, with plenty of room to progress, but there is also great attention to detail on the other features. This bike has a 15kg steel flywheel – not the largest but not the smallest either – and users can play with the resistance and track their progress. The console offers information on all basic data, with the added bonus of the built-in pulse sensors. Users can push themselves a little further, and enjoy the session a little more, with the additional features on-board. The comfort comes from the quality and depth of the padding across the bike. Not only is there great cushioning on the seat, there are also elbow rests. The bike is also fully adjustable and comes with an emergency stop lever and aluminium water bottle. 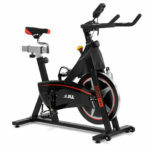 JTX is another leading brand that many consumers happily turn to for a great workout, whatever the style of machine. Here we have a gym quality bike that focuses on a slightly different niche of users. Some people want spin bikes for a tougher ride, others to train for road cycling and other for intense HIIT. This tough bike is ideal for this high intensity interval training. For a start, there is that tough 22kg flywheel with plenty of variation in resistance and a smooth transitions. This is classed as an infinity resistance system, so users should be able to push their sessions as far as they need to go. Buyers can then keep track of their stats and progression from the HIIT sessions via the console – which was recently upgraded with a bigger, better display. Users will also love the use of the Quadri-set frame from multiple adjustments, the smooth feel and the general ease of use. Bodymax is a brand that many fitness fanatics will associate with tough, intense workout systems. Yet, this model is a nice blend of helpful training aids and comfort features. 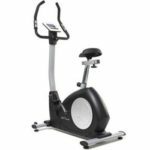 Not many people associate spin bikes and comfort, but here there is a functional, helpful machine that can provide the workout that users need. This Bodymax B2 is a little more gentle with the workout than some “pro” models here. The flywheel is only 13kg, and there aren’t as many settings on the quick-release tension knob. Still, this is a well-made, sturdy machine that users can trust. The frame is important here. It is strong and durable while offering great peace of mind. The 3 piece crank, chain drive and strapped pedals combine for a smooth, easy approach. The vertical and horizontal adjustments on the seat increase the chance of the perfect riding position. Finally, there is a free water bottle and plenty of padding on the handlebars. There are quite a few brands that like to make a point of creating the perfect riding position with their bikes. This is why so many models have such a wide range of adjustments on the handlebars and seat. 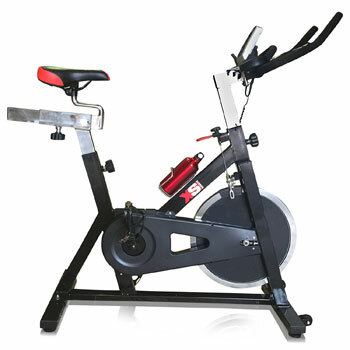 This We R Sports spin bike is a great example of top rated spin bikes that do just that. This model blends a realistic posture and build of road cycling, with the conveniences of an at-home exercise bike. This position comes from the shape and security of the bike. There is a strong frame, toe cages on the aluminium pedals and both vertical and horizontal adjustments. Users can then get the best out of their ride, in this optimal position, from the step-less resistance system and padded seat. Further details of note include the 13kg flywheel, the free water bottle and the transport wheels. 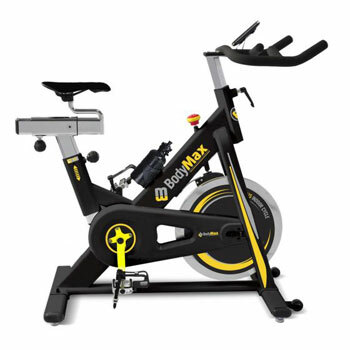 The latter cements this ideal of mixing road and indoor cycling into one great machine. This next model from JTX takes a different approach for a more laid back feel. The flywheel is much lighter by comparison, at 17kg, and there are 16 levels of electro-magnetic resistance and 12 pre-programmed workout. It isn’t the intense gym-ready model above, but it is still capable and accessible for many less experienced users. 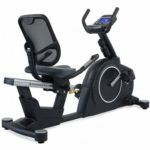 It also retains the adjustable frame and sturdy feel that all consumers look for with these top JTX spin bikes. However, there is no doubt that there is also improved computer connectivity with this Cyclo-5. The computerisation of these models is always important. It allows for clear, understandable data tracking. This JTX Cyclo 5 does so with a great console. Yet, there is also the ability to connect to iConsole and Kinomaps for Google Maps training routes and more. This helps to make the cycling sessions more interesting as users work on their goals. 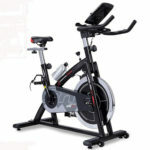 Understandably, many people look for new, updated models when searching top rated spin bikes online. They want something with the best tech and features for the best results. This B15 model from Bodymax is such a model. The designers have taken the time to work on the frame and strength of the machine, in order for it to handle a tougher regime. In addition to this, the 20kg flywheel is smooth and responsive for a great cycling experience. The main aim here was to create the sense of a road cycling experience for those that want to train hard. A lot of this comes down to that frame and the range of adjustments in the seat and handlebars. There is also a helpful brake lever and an LCD Monitor. Users should find that this offers a great upgrade not just in the parts used, but as an upgrade to lower-end spin bikes. 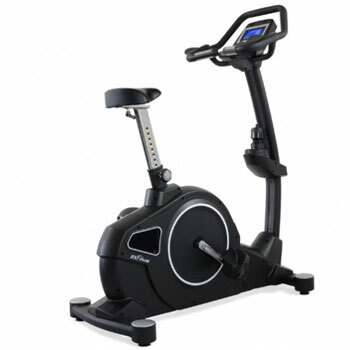 The last of these top rated spin bikes comes from Sportstech. Their SX200 model is a machine that tries to cover all the bases. There is the tough workout for those that want to train hard, plenty of interesting computerised elements and those essential comfort features and adjustments. The bike has one of the heaviest flywheels at 22 KG balanced, with that helpful step free resistance and smooth motion. Users can work out in the way they see fit, while tracking progress on the console. The sweat-proof pulse sensors and connectivity to iBiking and Google Maps add to this experience. The frame is once again sturdy and comfortable with great ergonomic adjustments. Users can adapt the seat and handlebar height and positions to get comfortable for an intense ride. There is also the bonus of the anti-slip pedals, a low-noise belt drive system, tablet holder and free water bottle. If the pro model above is attractive, but a little too intimidating for new users, there is the option to take a step backwards. This bike is very similar in its approach, style and purpose. It is pretty much the same model, just for intermediate users rather than pros. This becomes clear when comparing the specifications. The first noticeable difference with the hardware is that there is an 18kg flywheel, rather than 20kg. This could be just enough of a drop for less experienced users. There is still plenty of resistance and a smooth motion. The other difference is that there are fewer functions on the monitor. Even so, users still get helpful data on time, speed, distance, pulse and calories burned. Otherwise, this is a pretty impressive machine with the same great build and adjustable elements as other JLL models. It proves that a model doesn’t have to be “pro” to be of use. This “Studio” model is one of JTX’s attempts to bridge that gap between an at-home model and something that belongs in a gym. One thing that immediately stands out here is that there is a lot of talk in the sales pitch about the amount of sweat that users will produce. First of all, there is the sense that this can help users achieve a tough workout for fitness goals. This has one of the heavier flywheels in this guide at 22kg. Users can also get the best motions and feel to the workout thanks to the 360-degree pedal stroke and adjustable seat and handlebars. Then there are the other little details to the machine to keep it appealing and functional, regardless of the sweat. The heart rate monitoring system has been upgraded wireless receivers and a heart rate chest strap. The company realise that sweat on handlebar pulse sensors can lead to erratic results. There is also a nice stainless steel finish to resist rust and keep the machine looking good. Choosing the best of these top rated spin bikes for your home fitness suite. The models above show that there really are different approaches to take when choosing the best model spin bike for your home. At one end of the scale we have all those models that are designed as gym-ready, “pro” machines. They have the shape, intensity and programming to allow users to push harder. Some are perfectly suited for HIIT, while others mimic road riding a little more. On the other end of the scale are those machines that are a little more accessible and gentle. There are fewer settings and a lighter flywheel, but also plenty of comfort features and user-friendly elements. The choice depends on user experience levels and ultimate goals. Whatever your experience level and goals, it helps to find a model that brings together the very best features. Some elements, such as the app connectivity, may not be that important. 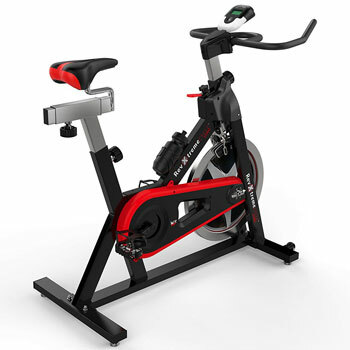 Still, the best spin bikes should have the right amount of resistance within a comfortable, ergonomic frame. They should be safe and easy to use, while still offering the challenge that users need. Many of the machines above do just that.